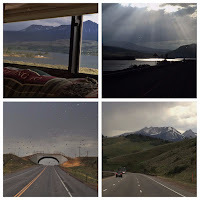 On July 10, 2017 we left Estes Park but instead of heading west we had to head an hour east back to Longmount as we needed to replace a tire on the RV. While packing up the outside for moving Les noticed two cracks in the back passenger tire. We arrived at GCR Tires and Service around 11 and they finished up around 4. We enjoyed lunch and just hanging out while waiting. Nancy helped to clean up their parking lot while collecting junk for her artwork. Thankfully at $470 a piece we only needed one tire. 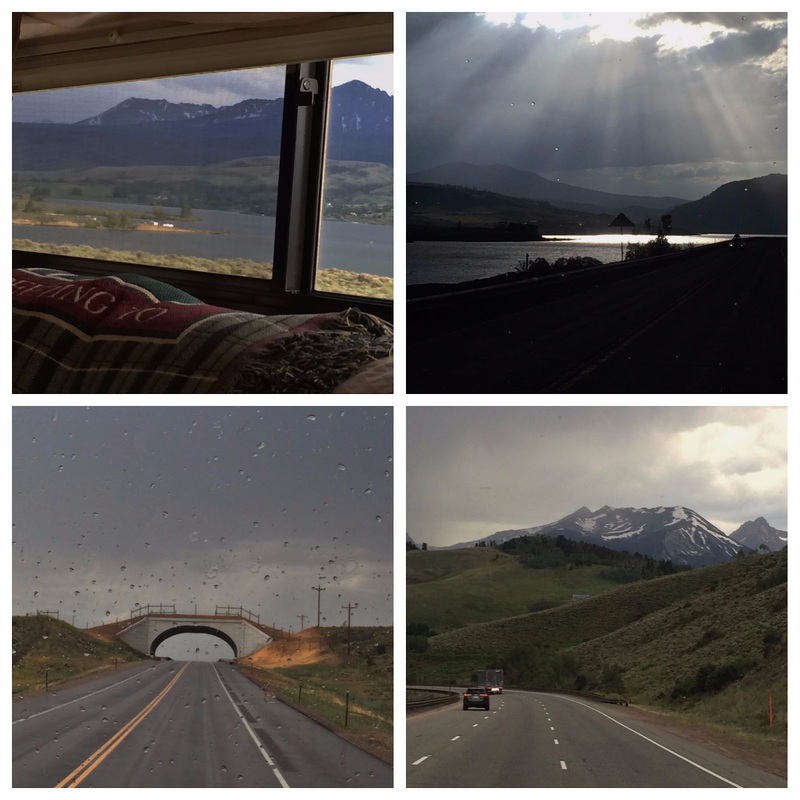 Our timing put us in Denver at rush hour as we headed to an over-night stop in Kremmling. We did see a cool car on the highway. 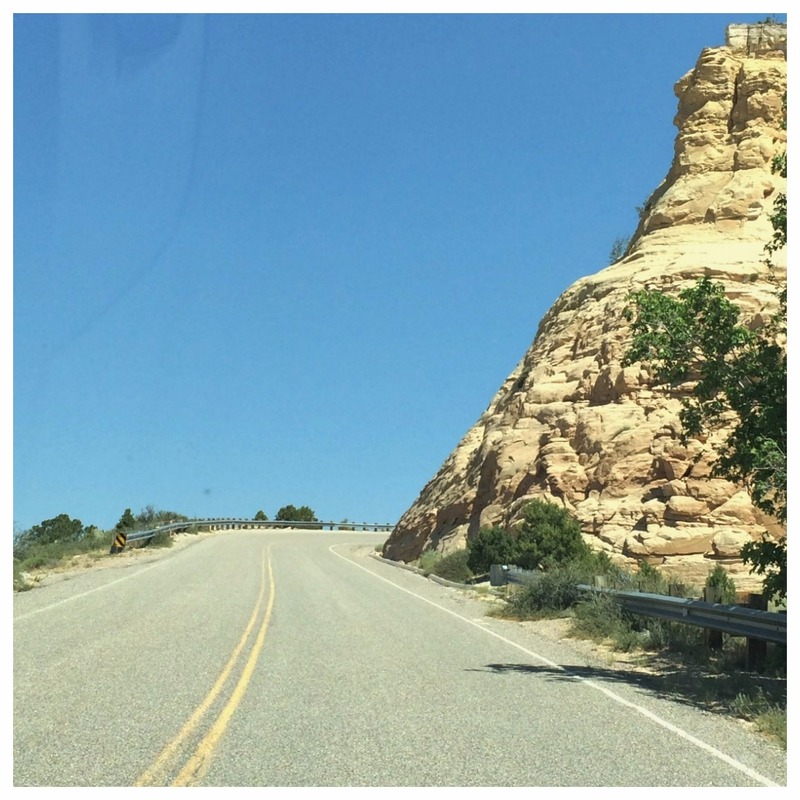 It was a beautiful drive - pretty sure it is impossible to have a drive in Colorado that isn't. 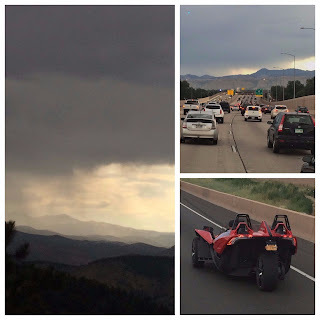 We did hit some rain along the way, but it was fun watching it come across the mountains. The rain came and went as we drove. The suns rays coming through the clouds over Green Mountain Reservoir were so pretty. It is always nice to see animal crossing bridges. 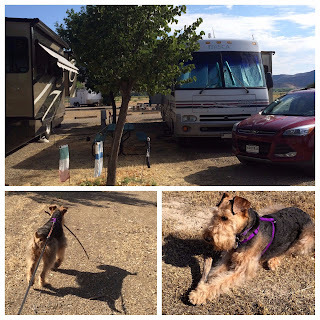 We stayed at the Wolford Campground. 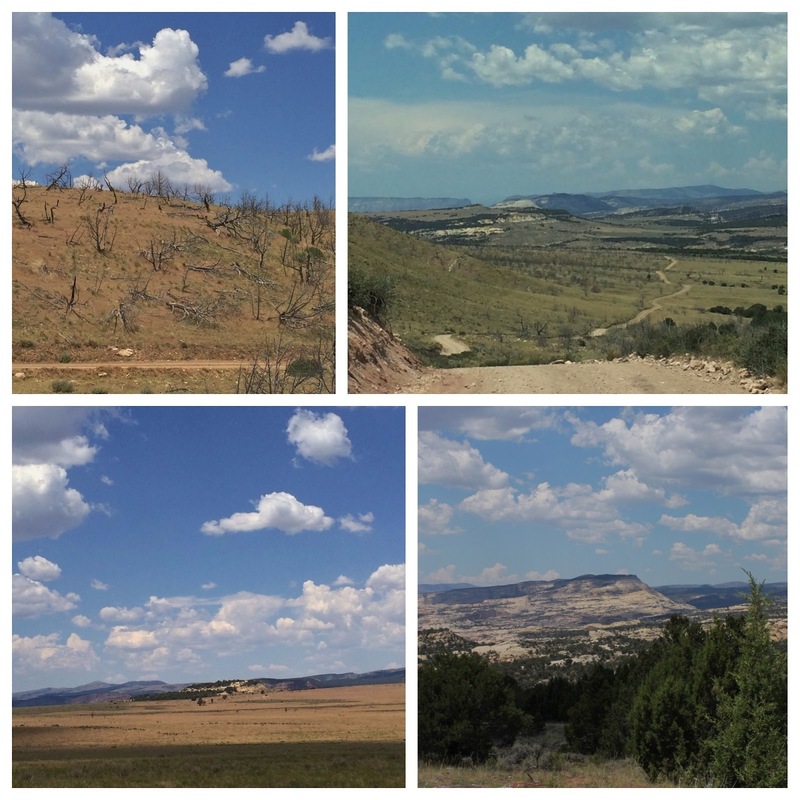 It is a state park right on the Wolford Mountain Reservoir. The gravel sites are pull through as you park on the road parallel to the site. This does put the electric box on the wrong side of the RV but our cord is plenty long enough to reach. The site was not very level. It has water and electric and there is no WiFi. There is a covered picnic table area and a charcoal grill. The views were the best part. We watched the sunset and a storm come over the mountains. The Prairie Dogs were pretty entertaining, no pictures as they move too fast. 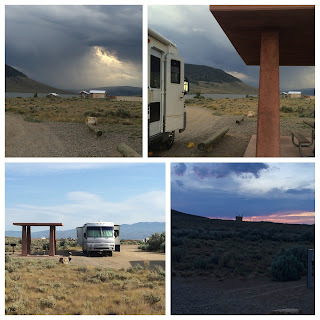 We paid $25 a night - $20 for the site and a $5 park entrance fee. 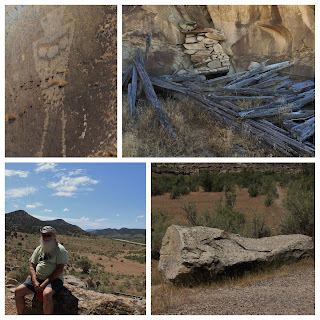 On July 11, 2017 we finished our trek to Rangely, CO.
We stayed at the Buck N Bull Campground in site B2. It is a small campground with 17 trailer sites and 12 tent sites. 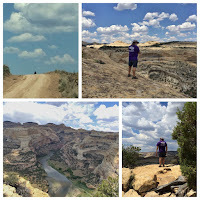 Sites are all gravel and fairly level with a picnic table, they are very narrow. Our site had water and electric only and there is a dump station. It's a quiet place and well kept up, about 10 minutes east of town. The bathrooms and laundry were very clean. There is a large field where Mielikki could run off lead, she brought a stick home with her everyday. 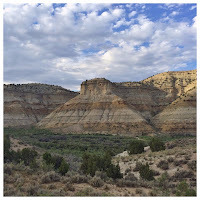 We paid $28.18 a night with a combined discount from Passport America and Good Sam. 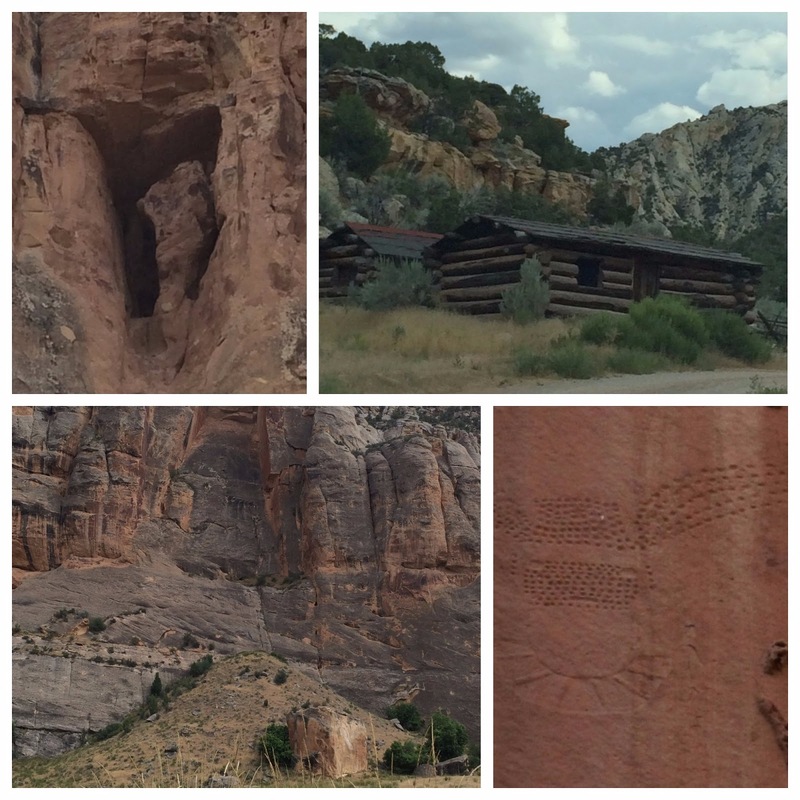 Rangely was a surprise, it is a very small town but has a lot to offer. 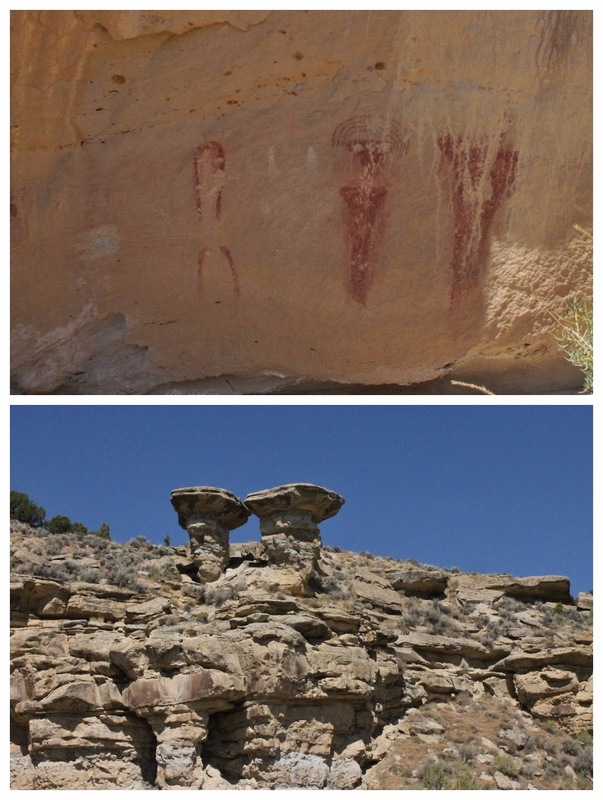 The town is surrounded by Rock Art. 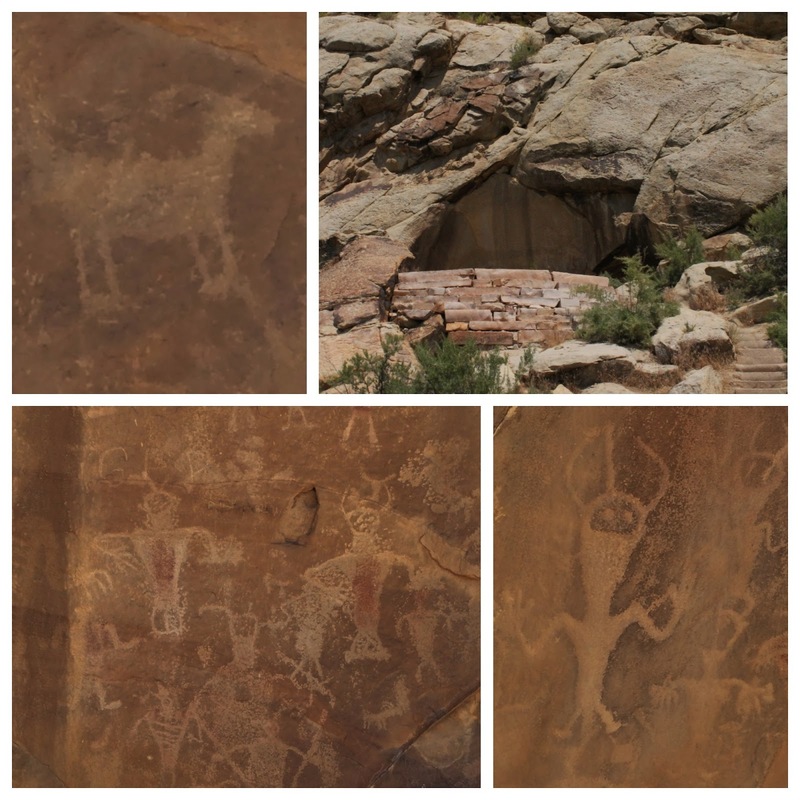 The surrounding hills are filled with Petroglyphs and Pictographs. 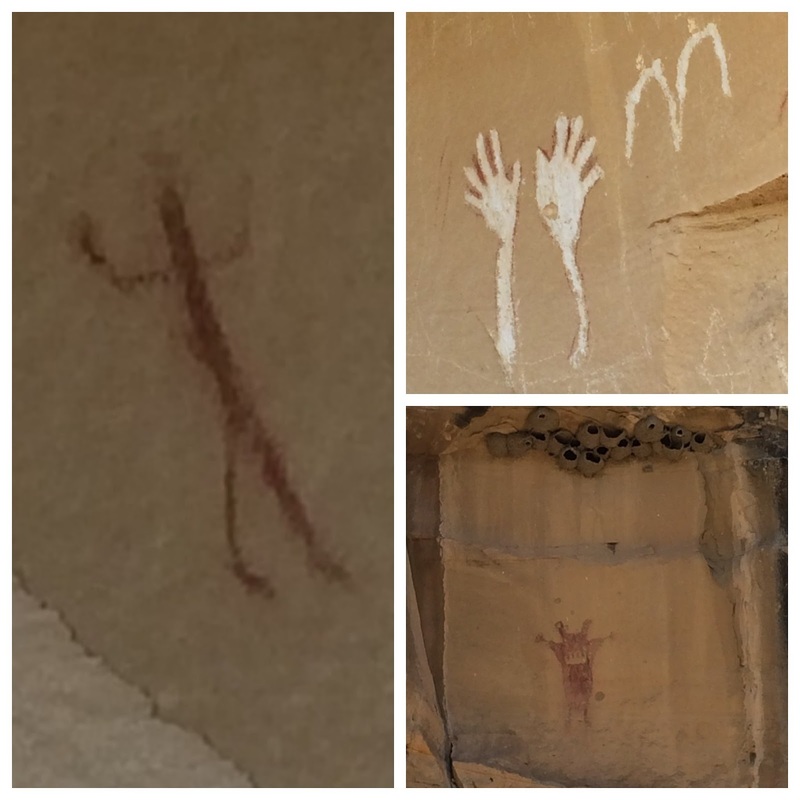 The Chamber of Commerce offers a very well put together book of the area that includes directions and pictures of the Rock Art. 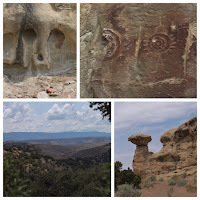 and a cool skull rock! We spent two days in search of them. 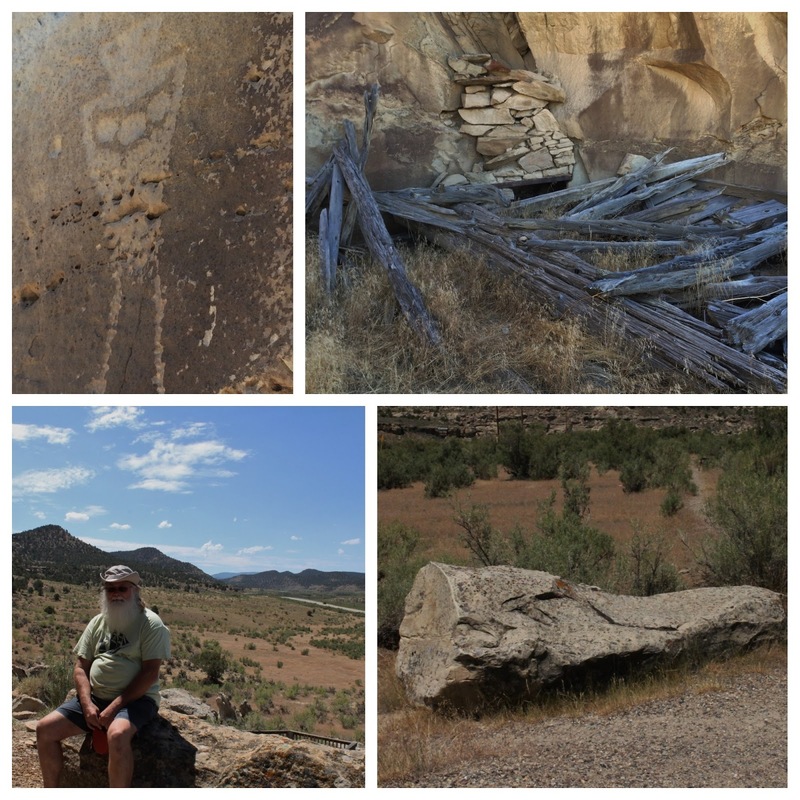 All of them are on BLM land and some are very well marked while others are hard to find. The roads are a mix of very rutted dirt to smooth gravel. Not sure how that car got there! 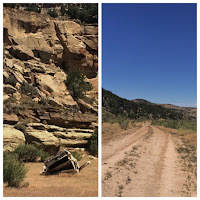 The area is the Canyon Pintado which is listed on the National Register of Historic Places. 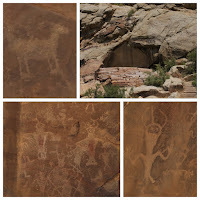 Not only will you find the Rock Art but if your lucky you will see the wild horses as well. We saw evidence of them (lots of piles of horse poop) but no actual horse. It is amazing that these pieces of history have withstood time so well. Some are still very vibrant and easy to see, others have faded. It is believed that prehistoric people occupied this area up to 11,000 years ago. 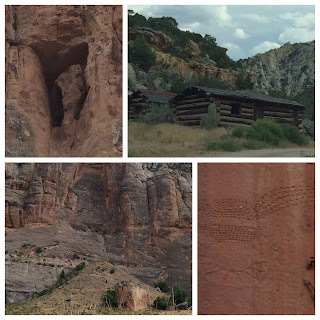 A variety of cultures have lived here over the years. 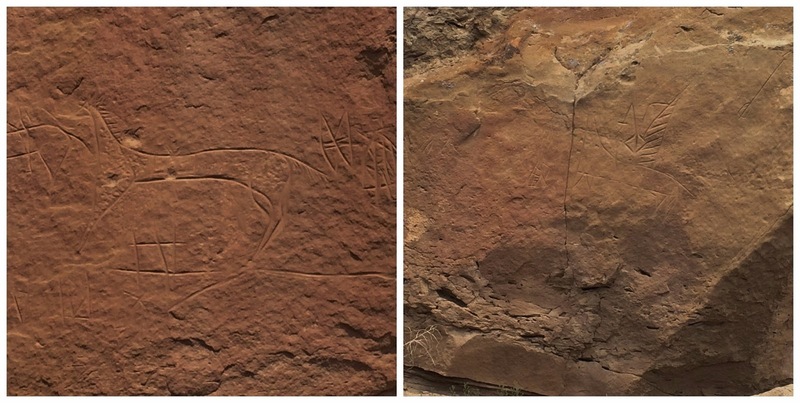 These pieces of art are from the Fremont and Ute civilizations long before the West was explored. 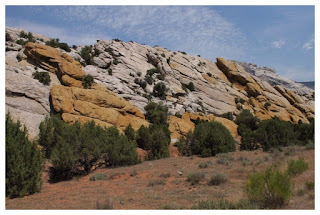 the name for the rock croppings. 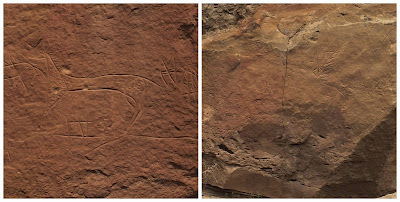 A Petroglyph is a drawing that has been "pecked" or rubbed into the rock. A Pictograph is a painted image using pigments from plants, minerals or animals. It is rare to find both methods used in the same pictures, but it has happened. have been found in the area. 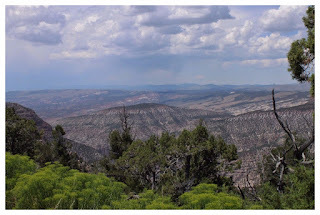 It was quite a hike to get to these Tapering Carrot Men - but the views were great. 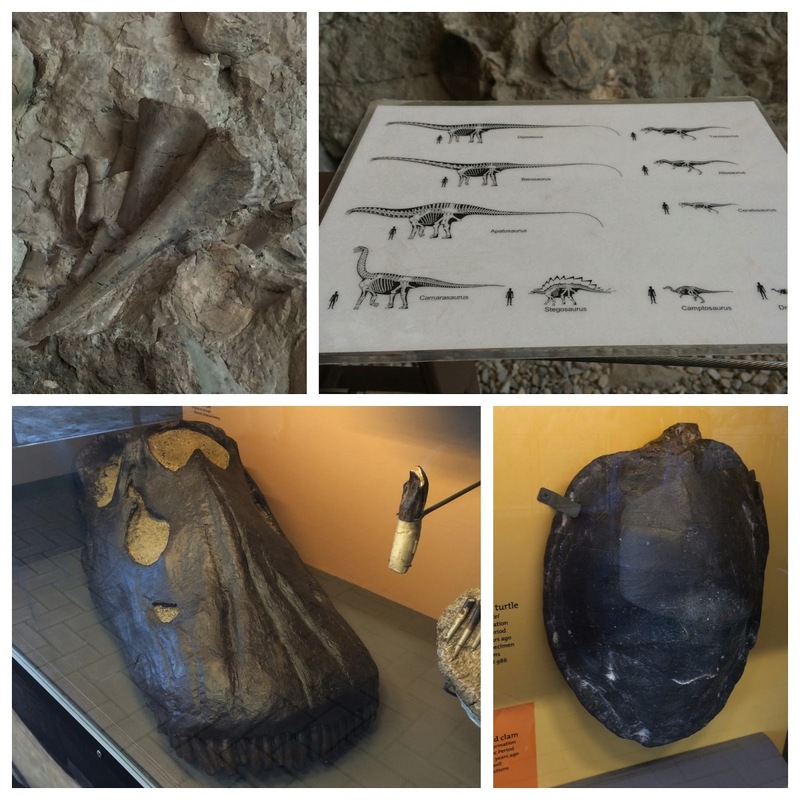 This was truly a Prehistoric visit for us as we also explored Dinosaur National Monument. The park crosses state lines with a portion being in Colorado and also Utah. 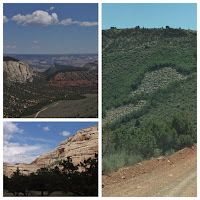 Utah was our first of three days exploring the park. It is the busiest part of the park as the Quarry Exhibit Hall is here. The Visitor Center is also located here. 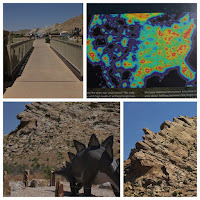 Outside of it you find a dinosaur who's back resembles the nearby ridge and a bridge that was made from a rail car. There is also a map that shows how lighted or dark the US is. The exhibit hall was pretty interesting with tons of bones left where they were found. 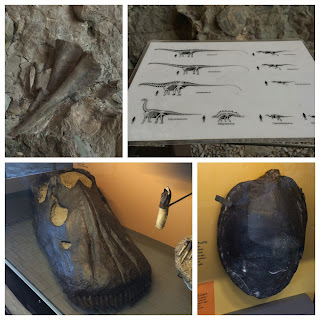 There are also fossilized displays as well as replicas of the creatures that roamed here. We had to chuckle when we saw the crocodile fosil as it really does look like the Croc shoes. After hanging out with the dino bones we explored the rest of the Utah park driving along the "Tour of the Tilted Rocks". Following the guide book we stopped at the 15 sites that end with the Josie Morris Cabin. 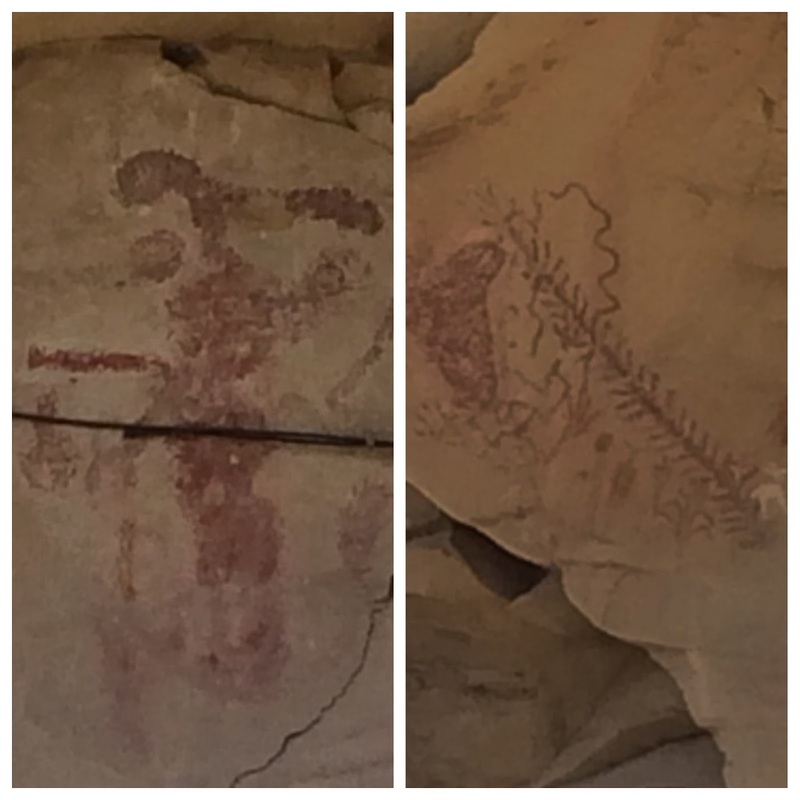 There are Petroglyphs at the "Swelter Shelter", (named by the researchers who were glad for its shelter from the scorching sun). 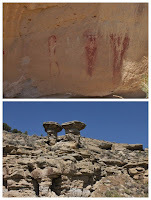 Some of the rock formations have been named for their shapes. 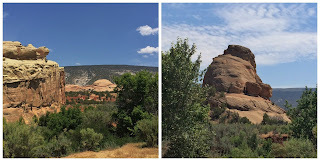 Turtle Rock and Elephant Rock are two of them. The "Tilted Rocks" were formed by forces deep underground that warped them upward. It also created what is called "Split Rock". 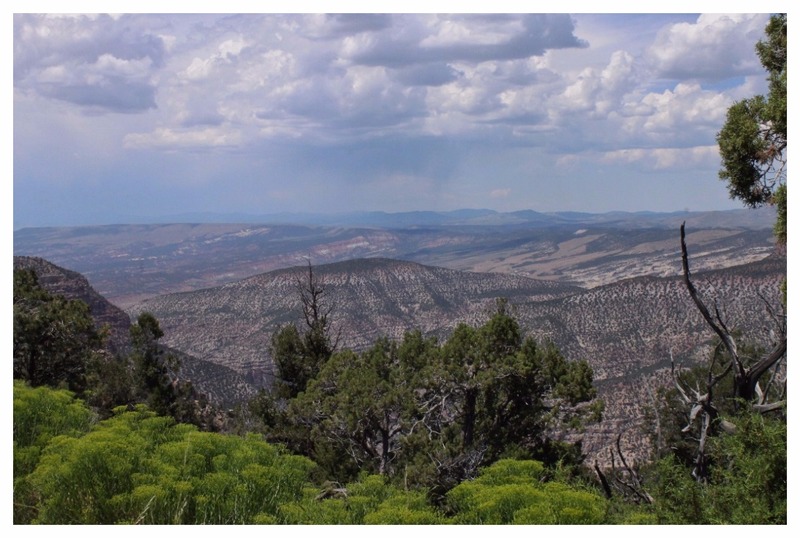 Early geologists believe that the river must have been flowing on its current course before the upheaval. As the rocks began to rise the river held its course and cut through them. 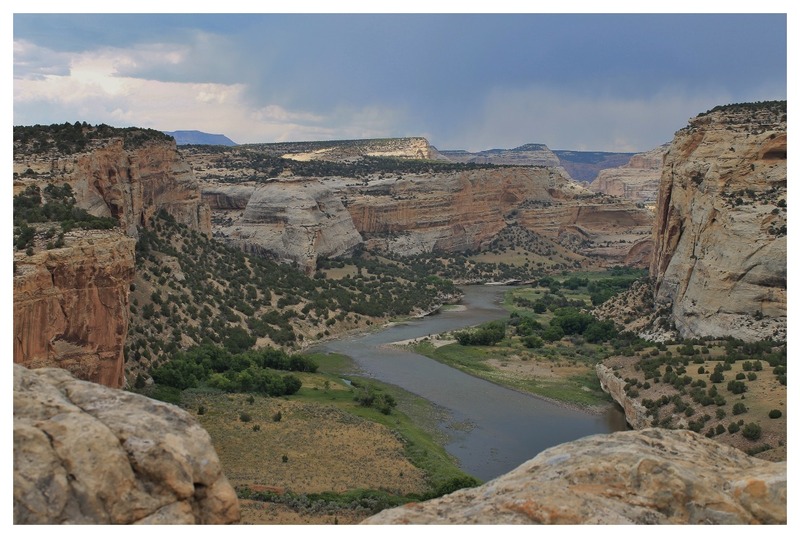 Current belief is that the Green River did not establish its current course until long after the upwarping as it seems the Split Mountain and Tilted Rocks are much older than the Green River. 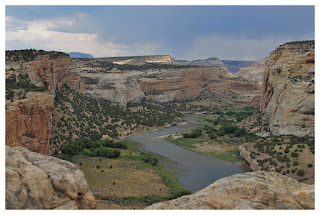 The Green River is the reason this spot was chosen by the Chew family for their ranch in the early 1900's. It is still run by the family and today they raise alfalfa and corn along with sheep and cattle. You drive through 2-1/2 miles of their property. Josphine Bassett Morris is a local legend and the road ends at her cabin where she lived life on her own terms. 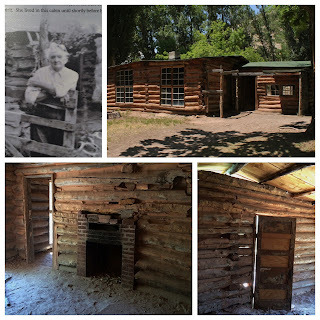 She settled here in 1914, after a childhood on a ranch where she learned to raise cattle, rope and herd along with farming and canning. This cabin is the last of many that she built. She led a colorful life with Ben Morris being the last of five husbands, after which she chose to stay single! Her relationship with the Butch Cassidy Wild Bunch was well known as was her bootlegging during prohibition. She was never arrested but was accused of cattle rustling twice. Her only source of heat was the one fireplace, she never had electricity and her water came from the nearby spring. In the winter of 1964 she slipped on ice after being nudged by her horse and broke her hip. She died that March just 8 months shy of her 90th birthday. 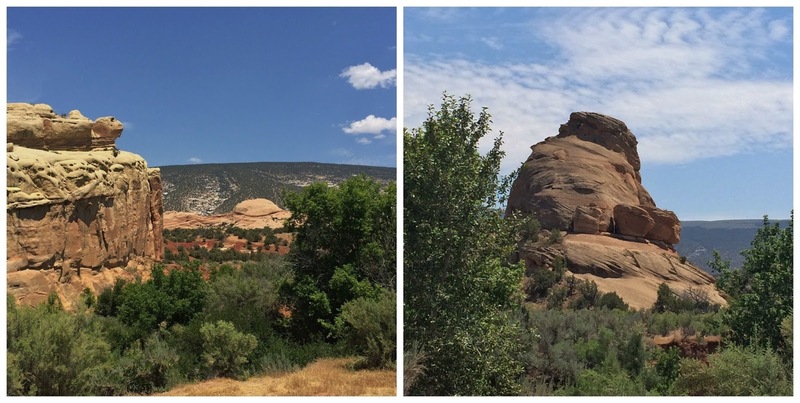 It took two days to cover the Colorado section of the park. The entrance road, Harpers Corner Road, goes through about 20-miles of private property before you actually get to the park. There are a number of overlooks with the last one being Harpers Corner. 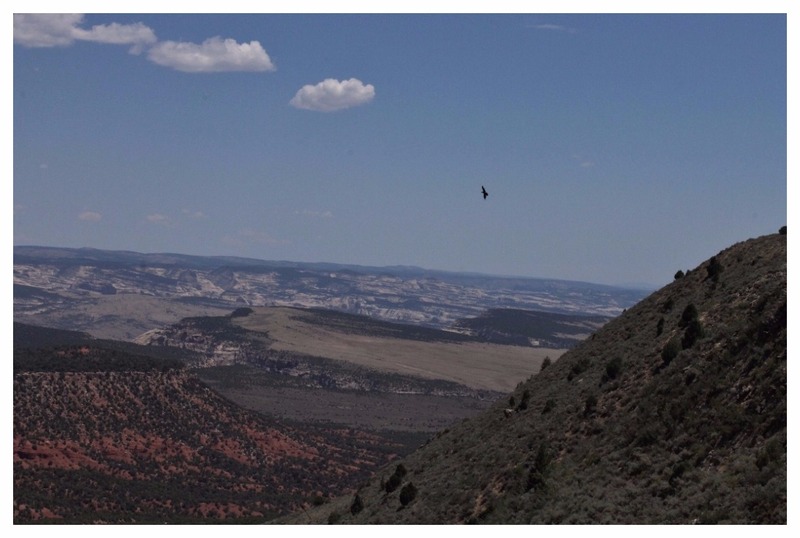 Here there is a 2-mile trail along the canyon ridge. 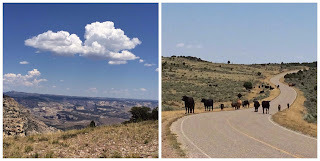 The entire park is an open range for cows and you have to be careful going around curves as many times they are standing in the middle of the road. Echo Park - as the crow flies. The center of the park is a large valley. 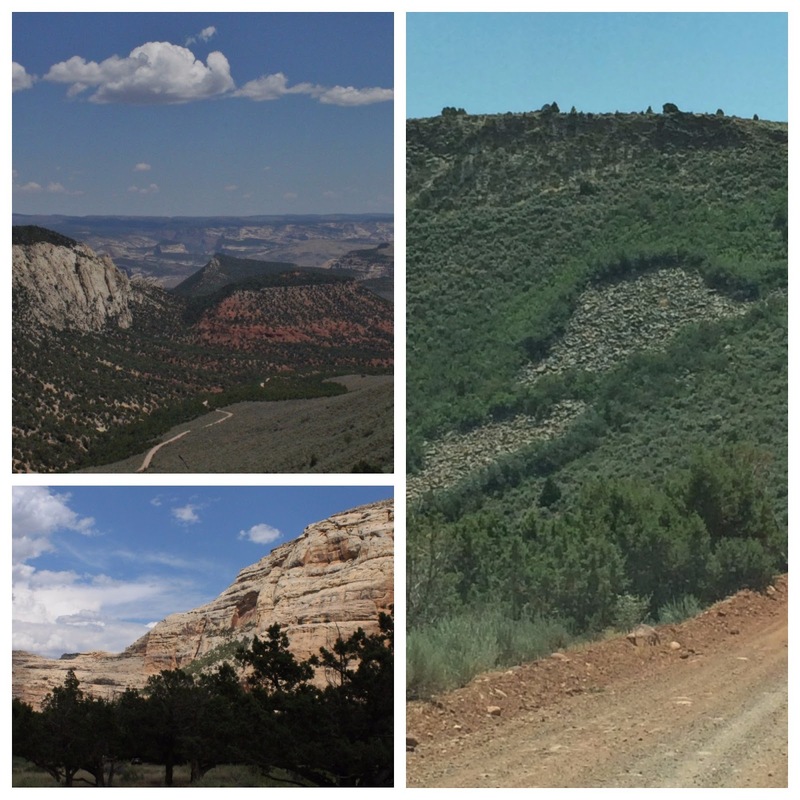 The Echo Park and Yampa Bench Roads run the length of it. It took two days to cover all of it as we ran into a flooded road the first day out. 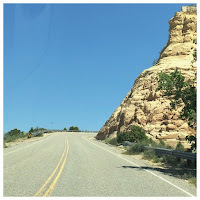 As you drive the road you are surround by ridges that are complete rock or covered in trees. We never tire of the different rock formations. On the road into Echo Park, where we had our picnic lunch you can stop at the Wind Cave. 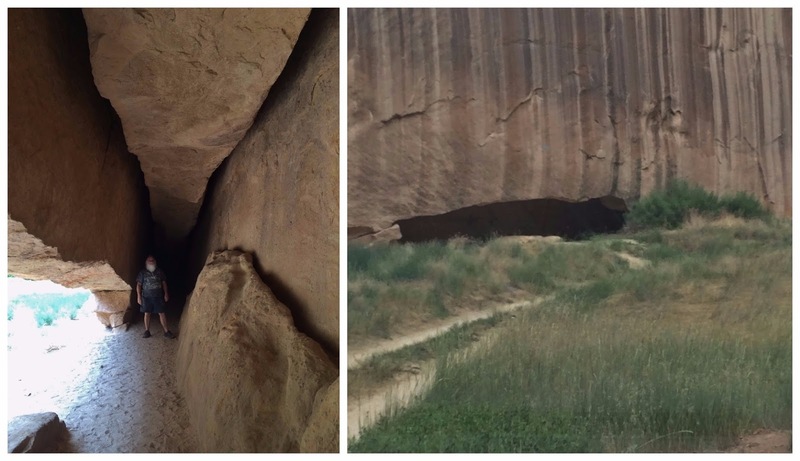 It is a narrow cave that has constant wind blowing through it. Pretty darn cool - in every sense of that word! 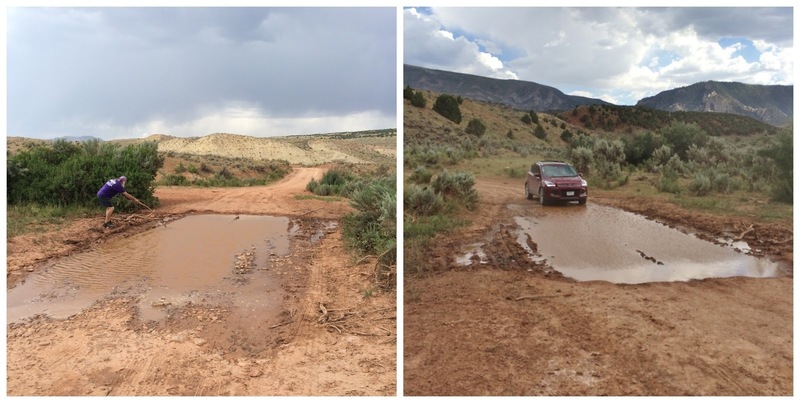 The second day we came in from the east side of the valley and when we got to the flooded road we discovered that the water had gone down some and after checking it we braved crossing it. 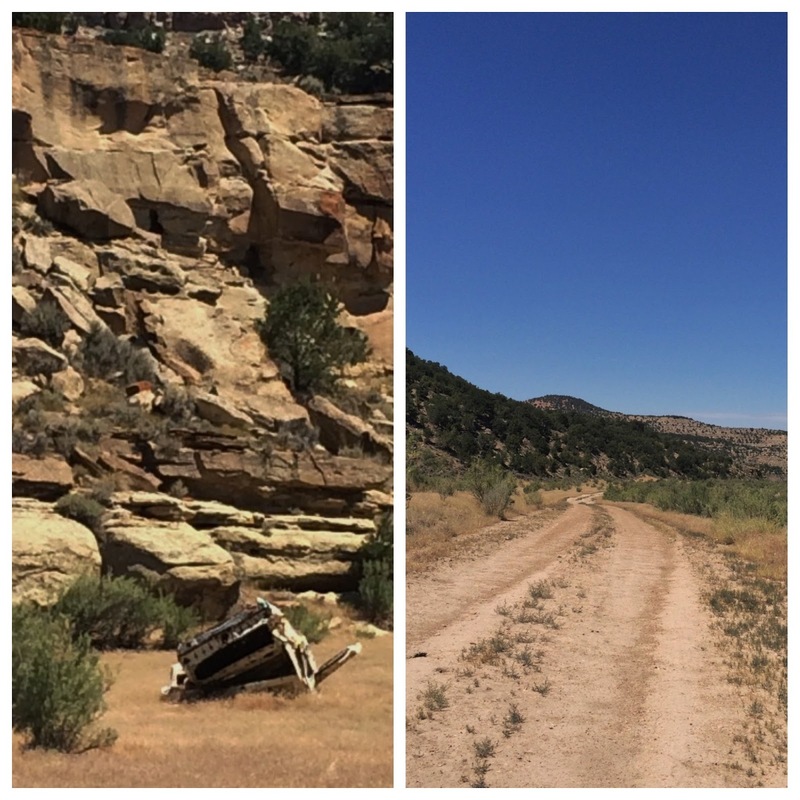 You enter at the Thanksgiving Gorge and drive through the West Cactus Flats. There were large sections where a fire burned out all of the trees. All of the overlooks along the way give you views of the Yampa River. Some are close to the road, others require hiking in a ways. It was absoluty breathtaking. Once again the power of water amazed us. 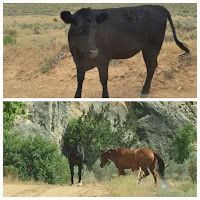 There were not only cows in this section but we came across horses as well. Not sure if they belong to someone or are wild, either way they were beautiful. We were so glad we didn't have to turn around and head back the same way when we hit the water. 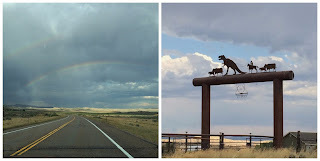 We hit a rain storm on the way back home but it gave us a double rainbow and we absolutely loved this ranch gate! Fire is a constant danger in the high desert. Both sides of Blue Mtn Rd into Rangely burned for miles just a week before we arrived. The air was still filled with the smell of smoke. 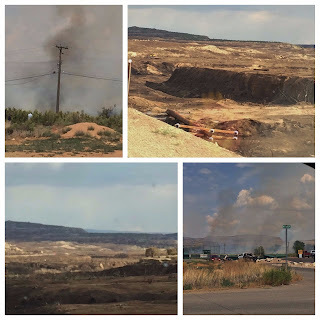 All of the telephone and electric poles burned to the ground and they were working on putting them all back up. One of the days we were there another fire started right in town. There are also a number of surrounding towns with interesting names. As we found out the names are about the only thing they have to offer. 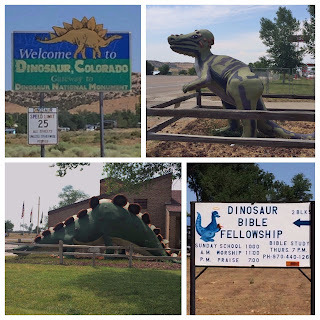 The town of Dinosaur is still an actual town and just minutes from the Colorado entrance of the park. Other than the Colorado Visitor Center there is not much there but we did get a kick out of the church sign. The towns of Bonanza, Rainbow and Dragon are not actually towns any more. Bonanza is an oil refinery and the only thing in Rainbow and Dragon are historical signs and some oil equipment and signal towers. 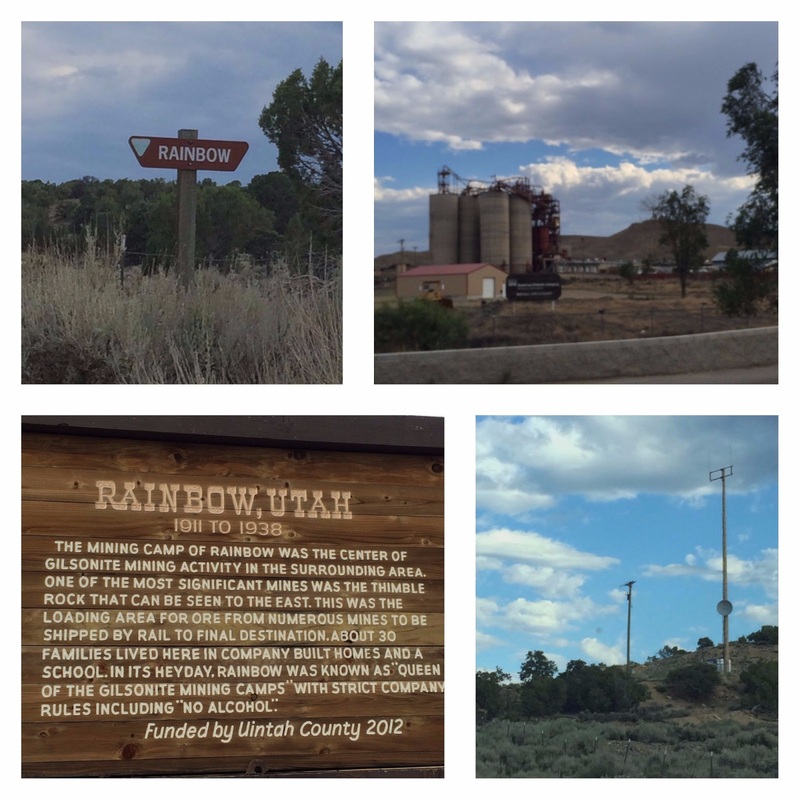 From 1911 to 1938, Rainbow was a mining camp for the Gilsonite Mining Company. About 30 families lived here and it had one of the few schools. It was dubbed the "Queen of the Mining Camps". 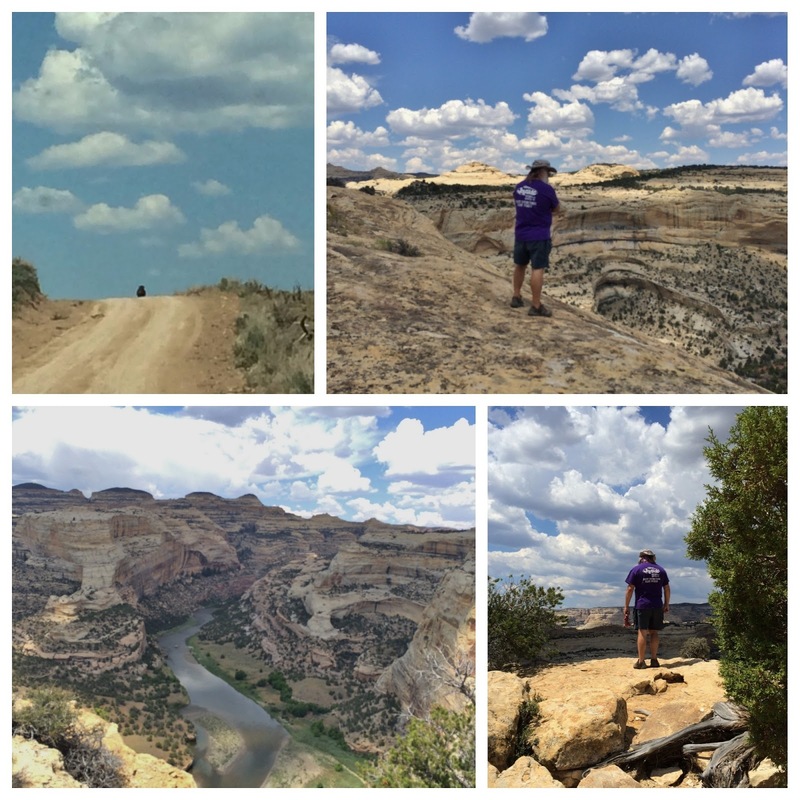 As you can probably imagine the road we took to all three towns was all gravel and a little rough in a few places but the scenery was quite beautiful. Dragon was a thriving railroad town from 1904 to 1939 and did much to bolster the surrounding area that still thrives today. When the railroad shut down the town closed up almost overnight. There are still remains of some of the buildings. So much to see and do here but moving on. Up next is Montrose and Cortez. The doors that conceal our washer/dryer have - or had - wooden slats that looked like shutters. Not very attractive, really hard to clean and they kept falling out. All good reasons to revamp the doors. So one yard of fabric at $7.00 a yard and about a half hour of time and we have new doors. They add a bit of color, will be easy to wash when needed and they are lightweight. Nancy made a pocket on each end and used the existing slats (one at the top - one at the bottom) to hold the curtains in place. Watch for another project that involves fabric paint, these flowers and colors as inspiration and boring drapes!